This package looks like a little "squished" plastic cylinder, with 3 leads. 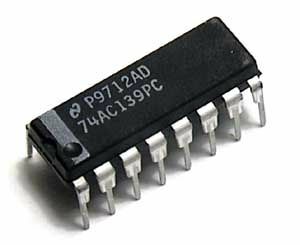 1381* ICs come in this package, as do many transistors. This package has a thin metal backing for heat rejection (basically, it's a radiator). It's used, as you might suspect, for components that need to reject heat. We'll just see it used for voltage regulators like the 78M05. DIPs are used for many "medium complexity" ICs. They have (as the name would suggest) two (dual) rows (in-line) of pins -- up to 20 pins total for the chips we'll be using. You can either solder directly to these pins, or plug your DIP IC into a socket, and solder to the socket's pins (use of a socket is generally preferred for a number of reasons). Craig Maynard has a nice page on IC packages here. Manufacturers are also good sources of IC package information -- Oki has an exhaustive page here, while Hitachi has a more-concise one here.